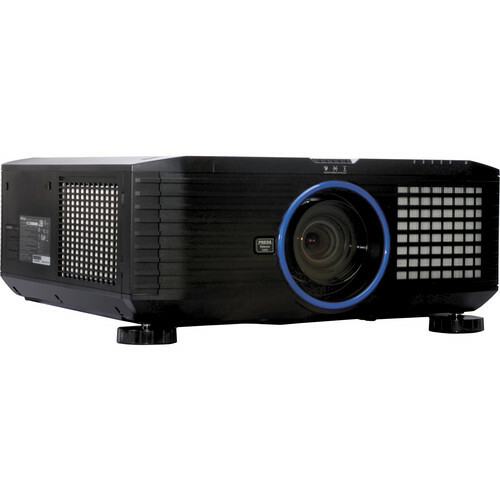 The IN5554L WXGA DLP Dual Lamp Projector from InFocus is DLP based a single chip design. Thanks to its 0.65" DLP DMD imaging panel (the part that forms the image) it can crank out true-to-life pictures. They can be in the NTSC, PAL or SECAM video systems or the full gamut of high definition HD formats including 720p, 1080i and 1080p. The DLP projector shines a brightness of up to 7000 ANSI lumens and a 2400:1 contrast ratio. It works just as well in a home media room as it does in a brightly-lit classroom, auditorium or lecture hall. This projector can operate just about anywhere in the world. It can handle power from 100 to 240 VAC at 50 or 60 Hz. Its on-screen display offers 16 menu languages to choose from. The IN5554L offers a dual lamp design. Dual lamps give you fail-safe backup, with a choice between single or dual mode. And with the rear lamp door, it's easy to replace the lamp even while the product is installed. This particular projector does not come with any lens, however, InFocus offers six interchangeable lenses so you can project your image the size you want from wherever you want. The lenses are easy to install and includes 10 memory options so you can save your options like zoom, focus, and lens shift. The first set of brightness values is achieved using the Presentation color wheel; the second set with the Cinema Correct color wheel.